Malcolm has a little pile of worksheets on “the apostrophe;” laying down the rules, telling you when and how to use an apostrophe. Like all good grammar packets, it has sentences to illustrate the possible applications of this particular punctuation mark. These sentences aren’t supposed to be interesting or memorable, they just have to be informative and correct. You can imagine somebody straining their brain to come up with something dull and appropriate, trying to think of a name they haven’t used yet for an imaginary possessor or omitter of letters and numbers. Well! The sentences in this particular package are a little strange, they’re even almost funny. Viz: “the girls’ logrolling team.” (Is that even a thing?) And “Lucas’ hobby is collecting pencil stubs.” I love this one! I can just see Lucas, walking along, brow furrowed, searching the hallways for discarded pencil stubs. He’s probably collected about 547 so far, and he used to keep them in a box in his room, but then he had so many that they spilled out of the box and fell to the floor. Maybe he stepped on them one night when he was half-awake in the dark, and he rolled on them like they were tiny logs, until he found himself splashing around on the floor in a pile of blankets and toys. So he decided to move them to the garage. He liked the garage, because it was quiet and private and full of interesting and possibly dangerous objects. It felt rain-washed and dusty. It smelled like fertilizer and gasoline and dried cut grass. And now it smelled like pencils, which was his favorite smell in the world. He separated his pencil stubs by color, of course, and of course he had more yellow pencils than pencils of any other hue, so he put these in a big green rusting metal box with a broken latch. And the rest of the pencils, the green, blue, red and black ones, he organized in little drawers of a plastic case designed to hold screws and nails and nuts. He dumped all the nails into a clanking pile on the floor, and he lovingly separated his pencils of many colors. The pencils with designs: covered with hearts or rainbows or foil stars or slogans like “reading is my superpower!” these pencils he kept in some old cardboard box. He wasn’t too crazy about them. He was a pencil purist. He liked the plain bright colors, the perfect lettering in black or metallic green. He was a true collector, an enthusiast.He would take note of each pencil’s condition in a special notebook (he wrote in ink): did it have an eraser, or had it been rubbed down or pulled off? A perfect eraser on a stump of pencil was a rare and wonderful find, a prized possession. Did the pencil still have a point? Was it a sharp point, or a stubby point with the wood of the pencil frustratingly longer than the lead? Did the pencil have teeth marks? He’d chewed on a few pencils himself, and he understood the appeal, the feeling of wood yielding to his teeth, the flecks of paint like tiny inconsequential shards of glass. He liked to think about all of the words that had been written with each pencil. Lots of homework assignments, sure, but what else? Stories? Love notes? In the art room he’d collected quite a few drawing pencils, black or green with a rounded white end instead of an eraser. Soft, thick leads. These were his favorite of all. If he stared at them long enough he could almost see all the pictures they had drawn: still-lives, self-portraits, dream scenes. He felt bad for the pencils. It made him sad that they’d worked so hard, and then been cast aside. Did they not still contain lead? Yes they did! (Well, most of them did) Could they not still write? Of course they could, if you didn’t mind a little hand-cramping. He himself didn’t write with them, ever. They were too perfect, too special, and so little of them remained–they would be gone so soon. What could he possibly write that would be worthy of these little stubs of possibility, these small stumps of potential? What picture could he draw that would justify using up the small store of unused lead? He lay awake thinking about it. Someday he’d write the most perfectly beautiful story ever written, and he’d use one pencil for each word, and then he’d put each pencil back in its chipped plastic drawer until the next time. Some day. What? Crepes made with french lentils? French lentils in the crepes? That’s right! Inspired by the Indian black eyed pea pancakes, I thought to myself, “Why not try this with french lentils, which are probably my favorite legume in the world?!?! I soaked them for a shorter time than the black eyed peas, because they don’t need to soak before cooking and they cook quite quickly. I added warm milk and eggs rather than water, and I seasoned them very simply, with rosemary and black pepper. They turned out good, I think! They’re denser than a regular crepe, and they have a lovely earthy flavor. We piled them with sautéed chard and roasted butternut squash, and we topped it all off with a mixture of grated mozzarella and smoked gouda and some leftover pistachio-pumpkinseed sauce. Very tasty, very satisfying, and very fun to eat. Cover the french lentils with water by about an inch, and let sit for five hours or over night. Drain the lentils, and put them into a food processor or blender. Add the milk, and blend until fairly smooth. Add all of the other ingredients and continue processing for several minutes, until as smooth as possible. Let sit for 20 or 30 minutes while you prepare the other vegetables. 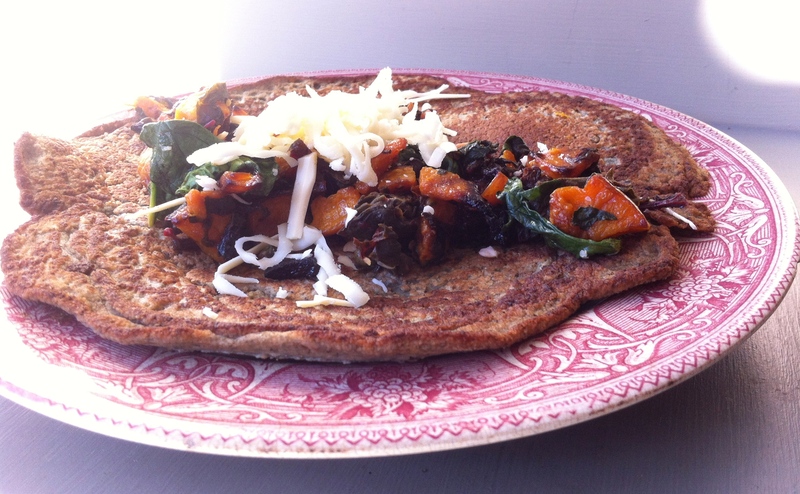 Fry as you would Indian pancakes…in a flat frying pan or crepe pan, melt a dab of butter. Pour in about 1/2 cup of batter, and with the back of a spoon in a swirling motion, make bigger circles to spread the batter out till it’s about 1/4 inch thick. When the top starts to loose it’s shine and look bubbly, carefully work a spatula under the pancake and make sure it’s loose all along the bottom. Flip, and cook until the second side is browned. Keep the crepes in a warm oven until the whole batch is finished. Preheat the oven to 425. Coat the squash with olive oil, and spread in a single layer on a large tray. Roast until they’re soft inside and starting to get brown and crispy outside. Set aside. In a large frying pan over medium heat warm one tablespoon of olive oil. Add the garlic and pepper, and stir and fry for about a minute until the garlic starts to brown. Add the basil and chard and about a tablespoonful of water. Sautee until the chard is wilted but bright. Add the capers, salt pepper and lemon juice. Stir in the butternut squash. We ate these with the chard mixture piled on the crepes and a mixture of grated smoked gouda and mozzarella on top of that, then rolled them up and ate them with our hands. 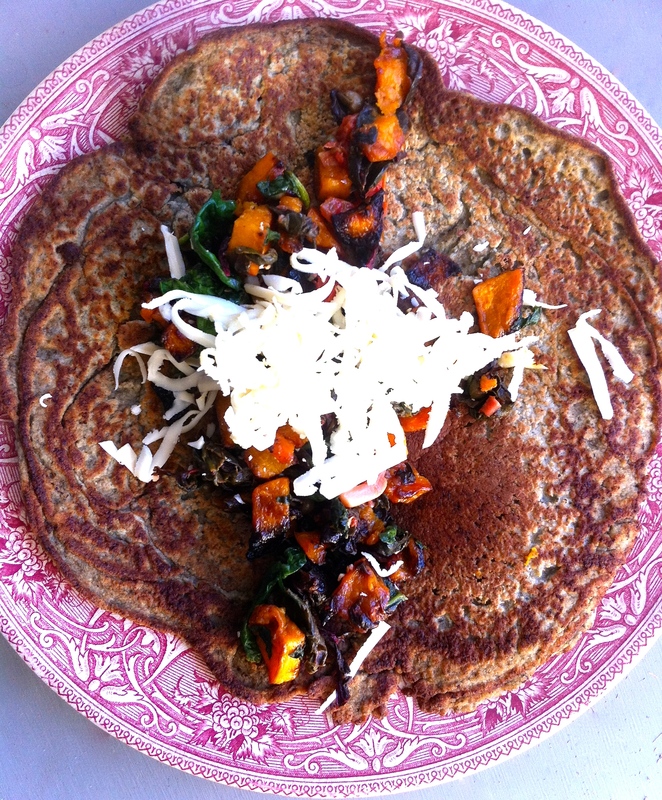 This entry was posted in bread, cake, lentil, recipe, sauce and tagged earthy crepes, french lentil pancake, lentil crepes, lentil flatbread, lentil pancakes, pureed french lentil by Claire. Bookmark the permalink. Mmm great flavours, that looks delicious! Been chuckling for the past day about Lucas’ pencil stub collection. What bizarre examples of apostrophe use! Thanks for your kind words. It’s nice to know somebody appreciates a post about pencil stubs!! Log rolling contests are alive and well in Oregon at the Albany Timber Carnival. I liked the way Lucas’ spilled pencil stubs turned into a log rolling episode. I collect paper grocery bags. At least in the West the bottoms of most bags are stamped with some employee’s name who was ultimately responsible for the bag. Right now I have bags by Audel Origel, J. Mercado and J. Gross. Hey, it’s cheaper than collecting designer handbags. I also collect security envelope patterns and make collages out of them. The lentil crepes sound really good. I love this whole comment! I didn’t mean to disparage log rolling activities, it just seemed such a novel thing to write about. Maybe the worksheet authors live in Oregon! I like how they made it a girls’ team, too. I like your collections. You could write a story about Audel Origel, J. Mercado and J. Gross. I wonder if paper grocery bags are stamped here. I usually bring canvas or get plastic (cause we have a dog!) I’ll check next time I go. I just looked it up and they haven’t had a timber carnival in Albany, Oregon since 2000! I never went and now I’ll never get to go. Oh, well, at least those girls are keeping the sport alive. Maybe we should write a story about the girls’ logrolling team! I could actually imagine logrolling becoming a trendy new pastime, on many levels. It’s time for a revival!